From the moment you arrive for your visit, our friendly doctor and staff will do their best to make you feel at home. We strive to deliver the best service possible – and that includes making you feel comfortable, getting to know you, and providing great dentistry. Dr. Radu is here to help you achieve your personal oral health objectives and provide you with a lifelong healthy smile. Your treatment plan is individual to your needs, health factors, lifestyle and budget. Because he’s competent in many types of general and advanced dentistry, you have numerous choices with Dr. Radu. You won’t find Dr. Radu pushing unnecessary dentistry. He will recommend the treatment plan that respects your desires, objectives and timetables. He takes the time to really explain what he finds, what needs to be done, and why – and he always goes over alternatives with you. You can expect the following services when you visit our office for the first time. What Dr. Radu calls a function exam is a look at your muscles, joints and bite. The way your teeth fit together when you bite down (occlusion) is a vital part of oral health and can even affect your overall health. 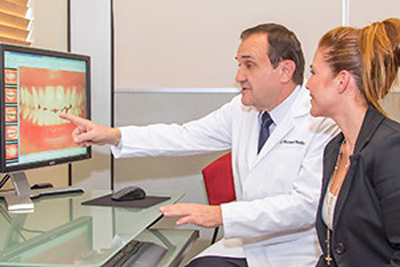 Dr. Radu does a computerized analysis of your bite using a precision diagnostic tool called a T-scan®. Next, Dr. Radu examines your teeth and gums for any decay, inflammation or other problems. He employs a modern intraoral imaging device called a DEXIS CariVu™, which illuminates and makes the tooth appear transparent for viewing on a digital screen. This allows him, and you, to see any cracks or decay under the tooth surface, not visible with traditional X-rays – with NO harmful radiation exposure to you. Dr. Radu does a smile evaluation and can even show you what your smile could look like after dental work. Dr. Radu personally photographs your mouth with a high quality digital camera. Next, a slideshow is created for you with “after” images to show you what your smile could look like with cosmetic treatment. Dr. Radu conducts an exam of your head and neck to check for any unusual conditions. Although it is rare to find any issues, early detection can help handle any problem before it becomes more serious. We use digital X-rays in our office for their high quality and low radiation. We use digital X-rays because they are not only more accurate than traditional X-rays, but they reduce the amount of radiation exposure by around 70%! With Dr. Radu, you’ll receive a full set of X-rays, including a panoramic X-ray if needed. Your personal consultation is scheduled for a subsequent appointment, so enough time can set aside for a thorough discussion. Dr. Radu carefully listens to your concerns, and consults with you on your needs and wants for your mouth and smile. Dr. Radu answers all your questions and gives you a written treatment plan after going over all the options with you. Our patients rave about the delicate, meticulous cleanings provided by Sharon, our award-winning hygienist. Your cleaning will be scheduled for a subsequent visit. $149 New Patient Exam, X-Rays & Cleaning! Digital imaging – see what your smile could look like! This offer applies only to new patients without insurance. To make an appointment, call 561.220.0454 or click here to request an appointment online.